He’d had no inkling that when the pestilence took hold Reykjavik would empty and convey the impression that nothing was happening at all; that the town would become an abandoned set that he, Máni Steinn, could envisage as the backdrop for whatever sensational plot he cared to devise, or more accurately, for the kind of sinister events that in a film would be staged in this sort of village of the damned–for those days the real stories are being acted out behind closed doors. And they are darker than a youthful mind can imagine. Moonstone: The Boy Who Never Was, Icelandic writer Sjón’s fourth novel to be released in translation, is set in Reykjavik in late 1918. This is fortuitous timing. A number of critical events converge over the course of a few months: the volcano Katla erupts in a dazzling display of fire and ash, the First World War comes to an end, and the small Nordic country achieves sovereignty. But the most devastating impact arrives in the form of the plague that is presently sweeping the globe–the Spanish flu. At the centre of the tale is sixteen year-old Máni Steinn, an orphan who lives with an old woman who is, as far as he knows, the sister of his great-grandmother. He is an independent spirit. He wanders around town, services “gentlemen” for money, and spends hours in the cinema. For a queer boy with no family history, illiterate, and alienated from his peers, silent films offer an opportunity to lose himself in fantasy, intrigue, and drama. A theatrical imagination dominates his dreams, at night and during the idle hours of the day. In general, his encounters with men are dispassionate, hurried and impersonal. But there are a few exceptions, men who show him affection and kindness, like the foreigner who, in a play on his name, christens him Moonstone. And then there is Sóla G–, a young woman from a prominent family, who is known for riding through town on her red Indian motorcycle. She is, for Máni, an embodiment of Musidora, the French actress who stars in one of his favouritefilms, Louis Feuillade’s crime serial, The Vampires. He worships her and, fortunately for him, she secretly knows and understands the kind of boy he is. He has a butterfly in his stomach, similar to those he experiences when he picks up a gentleman, only this time it is larger, its wingspan greater, its colour as black as the velvet ribbons on a hearse. An uncontrollable force has been unleashed in the country; something historic is taking place in Reykjavík at the same time as it is happening in the outside world. The silver screen has torn and a draft is blowing between the worlds. Very rapidly, Reykjavik begins to resemble a ghost town. The cinema still draws those seeking comfort, community, and warmth until the last available musician of any description collapses and the films, now unbearably silent, cease. But by this point Máni himself has fallen ill. The boy no longer has need of blood or bone, muscle or gut. He dissolves his body, turning solid into liquid, beginning from within and rinsing it all out, until it gushes out of every orifice he can find. He is a shadow that passes from man to man, and no one is complete until he has cast him. Upon recovery, Máni is recruited to accompany the doctor and his driver, the enigmatic Sóla G–, on the grim task of calling on the sick, the dying and the dead. Men, women and children fall indiscriminately. Within a few weeks though, the pestilence burns itself out and the survivors pull themselves together and drag themselves back to life and, soon, to the cinema. Over the course of one month, ten thousand citizens have endured the ravages of the illness, and almost every family has been directly touched by loss in some way. Attention now turns to the coming celebration of Iceland’s independence, but Máni will still have one major challenge ahead. Sjón has a light touch–an ability to spin a tale that unfolds with the spirit of a fable and feels lighter than air. He works in miniature with a sensibility that is poetic, weaving the strands of his tale with a glimmer of magic. But that does not mean his novels fail to explore topics of substance or create characters that live and breathe. The lingering impression is ephemeral, lyrical, haunting. Moonstone is dedicated to the author’s uncle Bósi, a gay man who died of AIDS in 1993. This novella sheds light on the clandestine and dangerous lives of homosexual men at a time when a country like Iceland, which fancied itself too robust to face threat from influenza, imagined itself to be a place where such aberrant behaviour could not possibly exist. For Máni, the “boy who never was”, it was a desolate place, save for the refuge of cinema. Placing the story in 1918, allusions to the plague that would devastate the gay community in the 1980s and 90s are unavoidable. And that much more powerful. 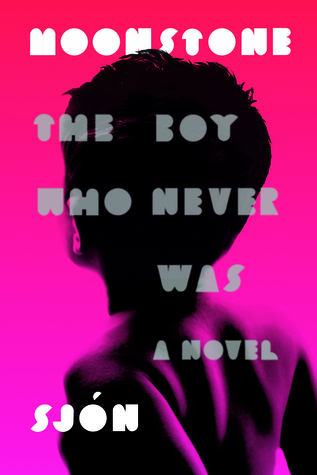 Moonstone: The Boy Who Never Was is translated by Victoria Cribb and published by Farrar, Straus and Giroux in North America and Sceptre in the UK. Originally published in 2013, the book won the Icelandic Literary Prize.